Check the date. So soon the shadows would come. A country’s happy childhood over. But on the bright side, authors and artists would have quite a lot more gloom to ponder–or at least a certain maturity (?). 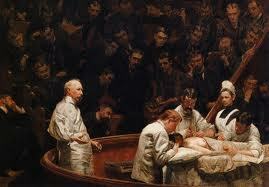 Thomas Eakins of Philadelphia is the best realist painter in American art! How can you not love an artist who captures the depth of human feeling with such sympathetic strokes? His women are deep and his men are serious, but also terribly loved. America had crossed over the Civil War and it shows in the attempt Eakins makes at realism. But does he succeed? Sort of. 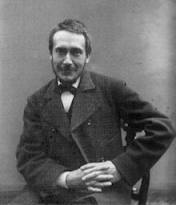 Especially with his more famous technical pieces. (but look closely at the transfixed crowd–there’s a tenderness here). There’s a point in realism (a bit later in history) that turns to alienation and ugliness. But let’s pause and enjoy something more like reverie . . .